After shooting 2015's phenomenal Tangerine on an iPhone, the word on peoples lips were what Sean Baker's next cinematic feature would be. The result is set over the course of one summer, following Moonee (Brooklynn Prince), a young girl who lives at Magic Castle, an extended stay motel run by Bobby (Willem Dafoe). During her days, she goes on adventures with friends, getting up to mischief, while unaware of life's realities, as her mother, Halley (Bria Vinaite), struggles to make ends meet. Sean Baker does wonderful work in capturing the innocence of youth, as the proceedings are guided from a childs point of view. She explores run down structures with her friends, treating them as some of the most fascinating places in the world. She holds onto the wonderful memories and moments shared with those she loves, unable to grasp the tragic realities, or consequences of it all. The darker elements are evident throughout, and sit alongside Moonee's perspective rather comfortably. Powering the film are the stunning performances, from talents new to cinema, and well known veterans. 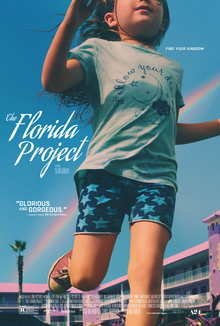 Brooklynn Prince is an exceptional young talent, perfectly capturing the happiness and innocence of Moonee, while blissfully unaware of the unfortunate realities of her and her mothers lives. Bria Vinaite puts a tremendous performance into Hallee, capturing her rebellious and carefree attitude, unaware of the effect it has upon her daughter. She does recognise where she's done wrong, and wants to do right by her daughter. Unfortunately, she falls into her bad tempered attitude by default. Willem Dafoe excels as Bobby, the motel owner who wants to help wherever possible, but finds it difficult with Halley. All throughout the picture are elements relating to Disney, which is characterised as the magical place full of hopes and dreams. A place which is close and within view, but remains out of reach to the residents of the motels. While selling perfumes outside a country club, Halley and Moonee walk past a Seven Dwarves sign, while a couple arrive at the motel, wrongly believing it to be the Magic Kingdom hotel at Disney. This element is prevalent all throughout, from the films title (an early name for Walt Disney World), to late in the film, depicting what can be described as a hopeful escape. With The Florida Project, Sean Baker makes himself known as one of the most interesting voices currently working in cinema. A beautifully shot and phenomenally acted piece of cinema, which deftly balances childlike innocence with the darker realities of life.